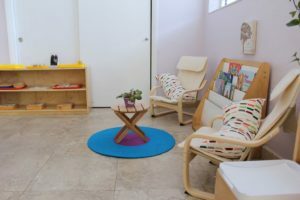 Gables Montessori is the only Montessori Preschool in the Miami and Coral Gables area that offers childcare services before and after school to accommodate the needs of the parents. We provide a bilingual program certified by the American Montessori Society (AMS) dedicated to the education of Preschool children, ages 3-6 and an early education Toddler program for children ages 18 months to 3 years, in a prepared environment of learning and discovery according to the teachings of Dr. Maria Montessori. We provide Mandarin (Chinese) language classes as part of our regular curriculum. We use ESOL Strategies (English for Speaker of other Lenguages) to facilitate learning for speakers of other languages. We are proud to have a number of children from other countries that are quickly learning to speak English and Spanish. 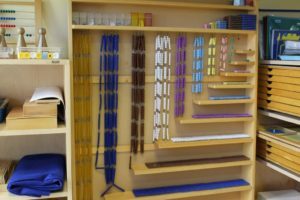 All of our classrooms are fully equipped with the latest Montessori materials. 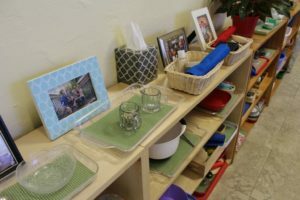 Dr. Maria Montessori created what she called “the prepared environment.” Among its features, is an ordered arrangement of sequential learning materials, designed to be developmentally appropriate and aesthetically appealing. 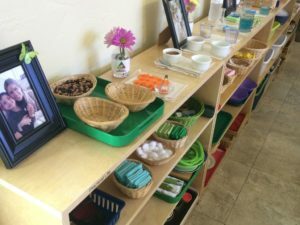 In the Montessori classroom, we use the material that allows each child to develop at his/her own individual rate. 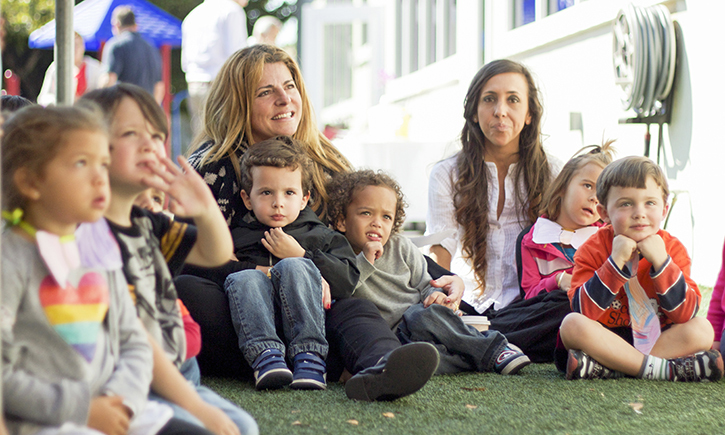 Both of our Preschool and Toddler Programs have fully equipped Montessori environments. The curriculum is individualized and designed to help the child grow at their own pace, gain self-confidence, independence, develop physically and socially, as well as promote academic achievement. Our goal is to provide a safe, loving and scholarly environment where our students can flourish and become future leaders. We believe that parents in this day and age have significant stresses in their daily lives and out entire staff works very hard to assure that the parents have peace of mind when they leave their child at GMS. Come discover us as we uncover the full potential of your child. 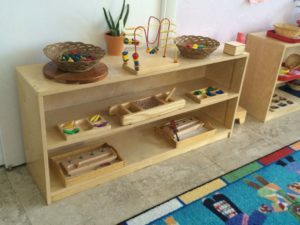 The Montessori curriculum is based on the scientific method and follows the preschool child’s inherent sensitivity to absorb knowledge from the prepared environment through the manipulation of precise didactic materials. The teacher acts as a directress, the dynamic link that connects the child with the materials. The lessons are presented one on one in a developmentally appropriate sequential order over a span of 3 years. Through critical observation and evaluation, and responding to individual needs, the teacher is able to motivate the child in attaining fullest learning potential. The Montessori curriculum promotes heightened confidence and self-esteem, self-direction and independence, enhances both social and emotional development, and affords a cognitive and sensor motor preparation for future academic excellence. The child is empowered to learn. The Montessori curriculum includes practical life, phonics-based language and vocabulary training, mathematics, science, sensorial training, geography and cultural studies, gardening, art, music and movement. By utilizing concrete representations of abstract concepts, the child is better equipped for problem solving and critical thinking processes. 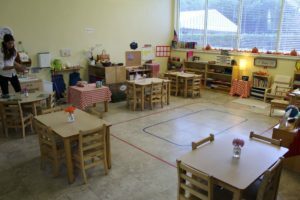 The learning environment is specifically designed to meet the children’s needs and abilities. 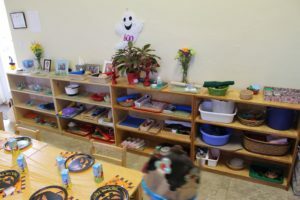 They are challenged in developmentally appropriate ways, each working at their own pace, in a supportive and nurturing environment. 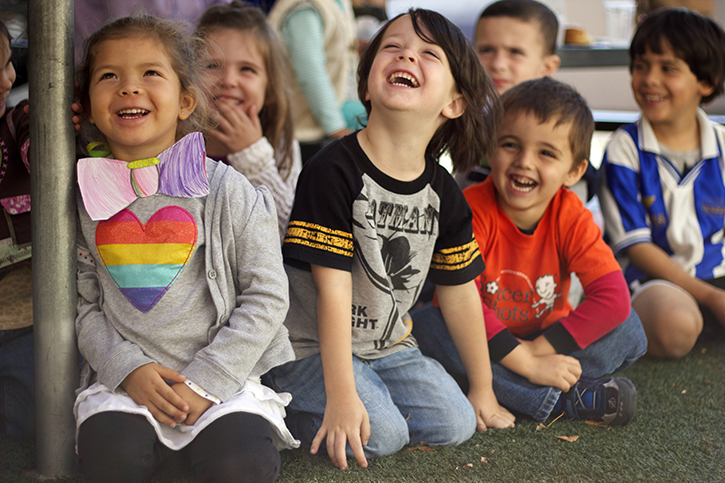 The Preschool and Toddler mixed age groups enable the children to learn from one another, take responsibility and respect each other’s abilities. There is cooperative learning and active role modeling. 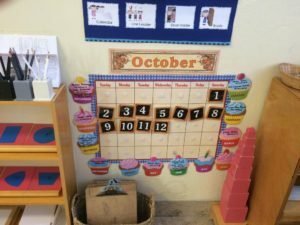 The children are free to explore and discover in a prepared environment to develop a sense of order, purpose, process, completion and success. 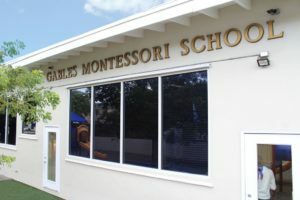 Gables Montessori School utilizes the Montessori method of education and Montessori materials developed by Dr. Maria Montessori. Dr. Montessori believed that children learn best by doing, not by passively accepting other people’s ideas and pre-existing knowledge. Believing that the young child had more potential than educators realized, she began to develop this potential by teaching the young child through his natural interest in exploring the world. 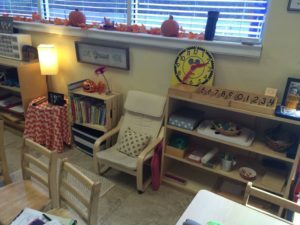 Her developmentally appropriate approach was designed to individually accommodate each child’s unique abilities. She devoted her life to the education of children. Her teaching techniques are presently used in public and private school classrooms all over the world. The goal of a Montessori education is to help children become responsible, self-motivated learners competent in all areas of life. The Montessori method recognizes “sensitive periods” in a child – especially three to six year olds – when he or she can absorb information from enriched hands on environment provided to him or her. 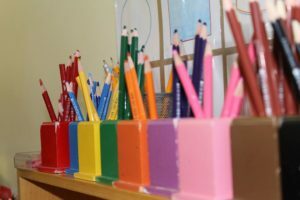 There is a “sensitive period” for all the things a child must learn to become a functioning adult, for learning new words, for counting, for using a pencil, for an appreciation of order and more. 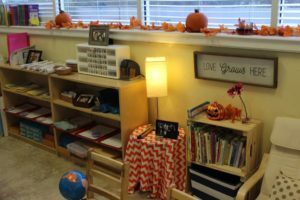 The Montessori classroom encourages this natural appetite of the child by offering age-appropriate materials to satisfy his or her intense desire for knowledge. A child who acquires the basic skills of reading and mathematics in this natural way has the advantage of beginning his education without pressure, boredom or discouragement. 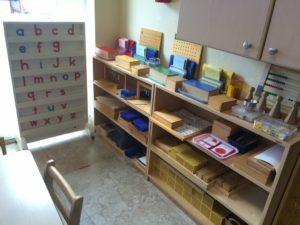 By pursuing his or her individual interests in a Montessori classroom at an early age, he or she gains an early enthusiasm for learning, which is the key to becoming a truly educated person. The teacher works toward developing the child’s sense of order, concentration and coordination. The Montessori environment promotes self-esteem, encourages fundamental motivation, spontaneous activity and self-education. 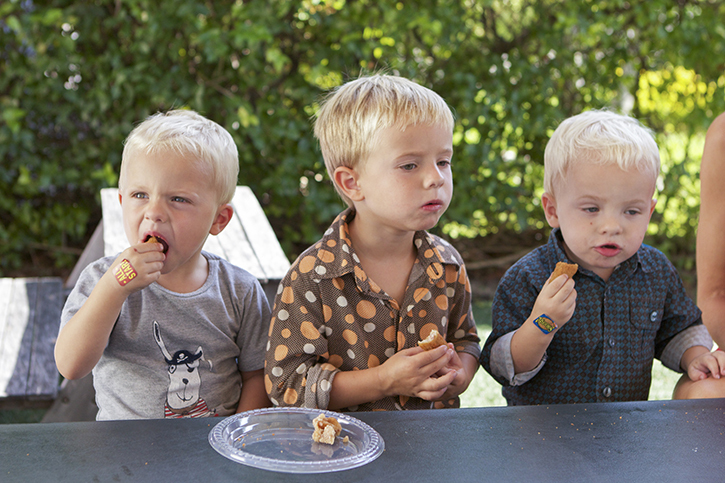 A Montessori education teaches a child respect for oneself, others, and the environment. 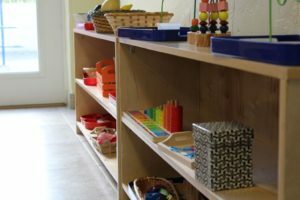 The Montessori method allows each child the ability to obtain a good self-image enabling him or her to feel secure, independent and self-confident. The fundamental motivation of a Montessori education is to guide the child to grow in knowledge and strength as a whole person and thus gain the practical skills and insight into determining their successes in their future lives. 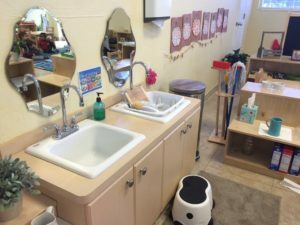 At the Preschool level, the hands on approach includes practical life applications such as going to the bathroom without help, preparing snacks and pouring drinks, washing dishes, buttoning, lacing, zipping, tying shoes, greeting a person, and cleaning up after themselves. The phonics-based language and vocabulary training includes many skills and tools, such as grammar symbols, key letter combinations, writing insets, sandpaper letters, moveable alphabet and matching sounds with pictures. Sensorial training includes skills and tools to enhance concentration, sense of order, and sensory impressions such as sound boxes, touch boards, secret box, geometric cabinet, baric tablets, pink tower and fabric box. These tools are used to promote dexterity, visual discrimination, and auditory distinction, gradations of texture, temperature, color and weight. 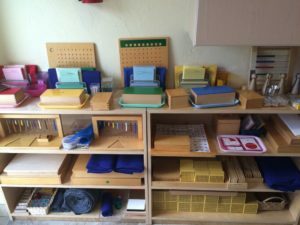 Mathematics at the preschool level includes counting, memory games, geometric solids, money, binomial cube, separating, time, number rods, golden bead bars and squares for discerning decimal quantities of 1, 10, 100, and 1000, measurement, comparing, spindle boxes and trinomial cube. Geography includes land and water globes, puzzle maps, flags, landform cards, and cardboard control charts. Science includes botany, biology, and gardening. Other subjects include cultural studies, art, music and movement. 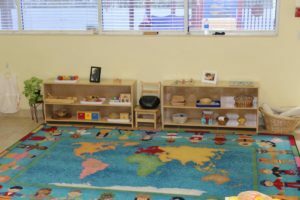 Our Toddler and Preschool Montessori Directresses are all certified by the American Montessori Society (“AMS”) and have over forty years combined Montessori teaching experience. Our Montessori Assistants have over fifty years combined experience of in assisting the Montessori Directresses. They are all committed to ensuring that your child receives a strong Montessori academic education in a carefully planned, stimulating environment. Through proven methods, we help children develop the essential foundational habits, attitudes, self esteem, skills and ideas that will shape the way they discover, learn and succeed in life. Our school has a FULL Member Affiliation with American Montessori Society. 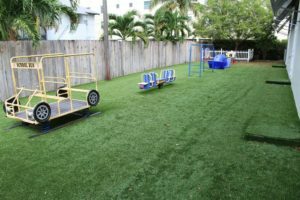 Gables Montessori has achieved a reputation for excellence as well as for providing an environment where children quickly flourish. We receive inquiries from all over the world and in fact, we have a number of students from other countries that have enrolled at GMS based on our reputation. Respecting and nurturing your child’s dignity and ability is a critical element of our program. In GMS classrooms, our directresses address the specific needs of your child though work, play, and practice with hands-on materials. Our teachers are keenly aware of your child’s developmental needs and introduce new challenges and materials accordingly. 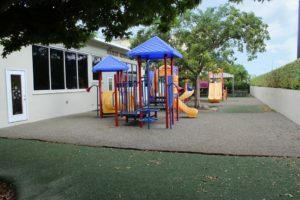 Download and print Enrollment Contract and mail Contract and Deposit check to the School or submit Contract via facsimile or email mcabrera@gablesmontessori.com with the credit card information. Schedule a Parent(s) and Child Interview for acceptance. 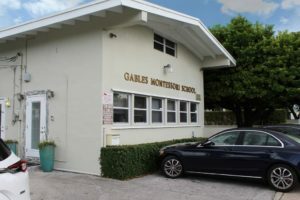 Nondiscrimination: Gables Montessori School complies in all respects with the Civil Rights laws of the United States and the State of Florida. We accommodate persons of all races, creeds and national origin. Note to all Applicants: A student may not begin classes until parents submit a current health and immunization record from the State of Florida. Call your Paediatrician for details. In some cases, a temporary exemption may be obtained.